Natural Resources Conservation Service in Kentucky is accepting applications for the Grassland Reserve Program (GRP). Although GRP applications are continually accepted, the application ranking cutoff dates for 2010 are March 15 and June 1. Applications received after June 1, 2010 will be deferred until the next ranking cycle. Births announced this week are: Kurt Dawson Fight, Dec. 31, son of Chris and Tammy M. Fight; Dakota Gene Knipper, Feb. 4, son of Mitchell and Donna Knipper; Gunner Keith Riley, Feb. 10, son of Patrick K. and Jill Kearns Riley. The Harrison County Middle School Site-based council will vote on dress code policy at their next meeting. 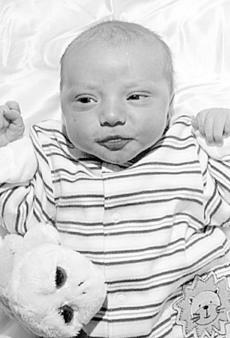 Blake Griffin Shadd was born to Crystal and David Shadd II on Jan. 9, 2010 at Central Baptist Hospital, Lexington. Josiah Marshall Custard was born to Sarah Forsythe and Chris Custard of Berry, Ky., on Feb. 14, 2010 at Harrison Memorial Hospital. He weighed 7 lbs. 11 oz., and is welcomed by his brother, Landon Desha Thomas Custard. Tom Perrin, state conservationist for Natural Resources Conservation Service (NRCS) in Kentucky announces that $775,000 is available in Kentucky for the 2010 National Organic Initiative to encourage more organic agriculture production. Funding for the initiative is being made available as part of the Environmental Quality Incentives Program (EQIP). Applications are being accepted now until March 12. These funds can and will serve to assist organic growers and producers in Kentucky. Births announced this week are: Cameron Brett Blankenship, Nov. 16, son of Steven Brent and Patsy Blankenship. Fourth grader Laura Kendall won the 8/9 year old girls classification in the State Elks Club Hoop Shoot Competition in Frankfort. A twin-engine Beechcraft Baron airplane crashes on a Leesburg farm claiming the life of a race car driver. • 50 years ago: Ideal Furniture Store opened on South Main Street. Godfrey Barnes is the manager. The Kentucky Agricultural Development Board approves $7,500 at their monthly meeting in support of a Deceased Farm Animal Removal Program in Harrison County. The Harrison County Fiscal Court submitted a proposal to the Harrison County Agricultural Development Council and the Kentucky Agricultural Development Board. The deadlines to file an application for natural disaster protection under the Noninsured Assistance Program (NAP) are March 1 and 15. The crops for the March 1 deadline are: Alfalfa, Clover, Grass and Mixed Grass intended for grazing, hay, or seed. A blanket of snow has the ability to brighten the dreariest of days. And, despite school closures and tricky driving, a snow-covered landscape proves to be quite beautiful. It’s not so bad for the plants either, so don’t be tempted to knock the snow off drooping branches. Snow has an insulating effect which is particularly useful when we do have frigid temperatures. Ground level snow will actually protect the roots and crowns of perennial and woody plants, but you may notice a little burn above the snow level when it comes to broadleaf evergreens. Cut flowers are undoubtedly the most popular manifestation of showing your love for someone on Valentine’s Day, but potted flowering plants do the trick, too. Perhaps the potted bloom has the potential to remind your lover that the sentiment lasts all year… but what does it mean if you can’t get it to bloom again? Is your loved doomed? Of course not, but here are some tips just in case. African violets are sweet and have the ability to bloom all year round so consider these as a lasting representation of love. Amelia Grace Simpson was born to Drew and Carrie Simpson of Cynthiana on Jan. 12, 2010 at St. Joseph East Hospital in Lexington, Ky. She weighed 6 lbs. 3 oz. Khloe Michelle Lynn Thomas was born to Johnathan Thomas and Lisa Milner of Cynthiana, on Jan. 5, 2010 at Harrison Memorial Hospital. She weighed 6 lbs. 15 oz., and is welcomed by her sister, Payton Price and brother, Connor Hall. •Eugenia Marie Royalty and David Earl Fryman, both of Cynthiana, announce their engagement and forthcoming marriage. The wedding will take place Saturday, April 3, 2010 at 4:30 p.m. at Cynthiana Christian Church. A reception will follow immediately after the ceremony at the Cynthiana Elk’s Lodge. Formal invitations have been sent. The Linville reunion will be held Sunday, Feb. 21 at Northside Elementary beginning at noon. Lunch will be served at 1 p.m. Bring a side dish or two to share. The University of Kentucky received a grant to offer a program for new and young farmers. The program is now being offered to groups of counties in a local area. Harrison, Scott, Bourbon, and Nicholas are coordinating a (four) county program to run for a two year period to assist in many of the decisions making processes on the farm. When it comes to the home orchard, some pre-planning is a must. Some fruit is easier than others and it is often hard to discern in the catalogs which apple variety, blueberry or persimmon will do well in Kentuckiana. My No. 1 rule is the more information a catalog provides the better. Gathering as much information as possible is the key to success when it comes to fruit trees. So where do you find the information? A good place to start is with local university research and recommendations. Births announced this week are: Trevor Wayne Carter, Jan. 4, son of Rose Pollard and Tim Carter; Madison Marie Coppage, Jan. 14, daughter of Wayne and Shelley Coppage; Macie Rose Howard, Jan. 25, daughter of Harold and Patricia Howard; Sarah Michelle Martin, Jan. 26, daughter of Melissa Mae Martin; Keeley Elyse Massey, Jan. 24, daughter of Aaron and Gracie Massey; Skyler Leigh Moore, Jan. 7, daughter of James and Darlene Moore; Juan Jakob Shelton Sexton, Jan. 28, son of Paco Navarro and Angie Sexton.